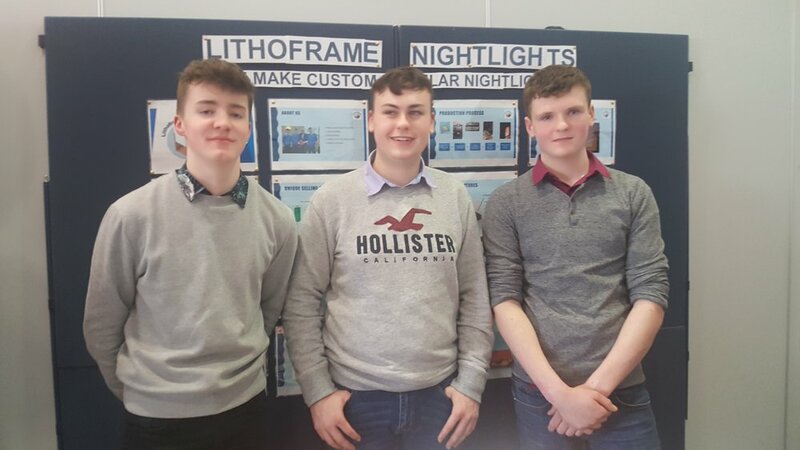 On Thursday 14th March two groups of enterprise students and their teacher Ms Brosnan travelled to Dublin for the Griffith College Business Enterprise Competition. It was a fantastic achievement to have two teams shortlisted to attend as only 10 of the best teams across Ireland were selected for the finals. Stage 2 required students to use their social media skills to market their business idea by creating a social media page and promoting it to as wide an audience as possible. After a few weeks of preparation, campaigning and practising public speaking skills the teams travelled to Dublin for the final. The bleary eyed students assembled in Cork Kent train station at 5.30am. After a cup of tea and some snacks the students and their supporters Meabh Aherne and Diana Harrington regained the energy for the day that lay ahead! It was a relaxing journey for the students who had the opportunity to practice their speeches and spend some time with their classmates. On arrival to Griffith College students were welcomed by guides and checked in at the reception. Team finalists were then whisked away by their mentors for a 2 hour session on presentation skills and set up of their display pods. Supporters and visitors had the opportunity to attend business workshops by the Business Faculty on areas such as Entrepreneurship, Marketing, Economics, Management, Job Tips/CV’s and Hospitality. After the mini-lectures students enjoyed a packed lunch before returning to the arena to view the display pods and meet the finalists. Over a period of an hour a panel of three judges interviewed each team at their stand. At 1.30pm all the finalists and supporters were gathered in preparation of the Oral Presentation. Teams were randomly selected and invited up to the podium to complete the final stage of the competition – the oral presentation. This was a very nerve-wracking time for all the finalists as each team gave a 5 minute presentation to an audience of over 400 which was followed by 3 minutes of questions by the panel of judges. As judges deliberated each team was invited to the podium to be photographed and presented with Certificates of Participation. Finally the results were announced and although our teams didn’t win it was a very insightful and rich learning experience for all involved. We were very proud to have had two teams competing in the finals. Students left with a greater confidence, improved oral presentation skills, a bank of business ideas and knowledge, some new friendships and even some life skills on how to navigate the Capital! The students who competed and supporters who travelled were a credit to Kinsale Community School and represented their school with great pride. Well done to all involved!